In J.R.R Tolkien’s Middle Earth1, the human realm of Gondor is without a King. Denethor serves as its steward, but Denethor has gone mad, Gondor is weak, and the forces of darkness are stirring beyond the mountains in the East. The future of humankind looks bleak. Only one thing can set things right: The return of the King. The heir to the throne in Minas Tirith must come home. 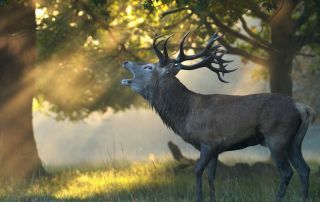 This article is the first in a series of three from Reclaim your Inner Throne. My vision for the series is to combine Tolkien’s profound wisdom with the lens of neo-Jungian archetypes and the unique insights of Reclaim your Inner Throne to form a nuanced and integral lens to our present day world situation. In this first article “The Dark King in our midst”, I will offer a quick background story, before I try to give you an understanding of the archetypal forces of the deep unconscious that are currently at play in humanity. I will continue by introducing you to the archetypal Shadow King and his efforts to usurp the throne of humanity. In the second article “The Kingdoms of our Lives”, we will go deeper into the archetypal dynamics of the King and his kingdom, and use them as a lens to deep self-realization. We will also use them to assess the health of the communities in which you participate, and find whether there is shadow there. In the third article “Making Love in Times of the Apocalypse”, I will complete the series by describing how present-day world events and the forces which move in the collective put humanity at a crossroads, and how you right now have an unprecedented opportunity to step into your gifts and joyfully live out your purpose on this Earth. The best part? Never before in the history of humanity has that been easier! If you consider yourself an agent of transformation in this species-wide rite of passage I believe we are in, you must address the fierce energies that are currently waking up in the world. You must do so both in yourself and in your communities, in ways that humble you and bring you vibrantly alive. This series of articles is dedicated to that process. In the work of neo-Jungians Robert Moore and Douglas Gillette, they put forth the idea that the psyche is governed by four primary archetypes: Sovereign, Warrior, Magician, and Lover. The Sovereign (King/Queen) is the central archetype, and brings the distinct psychological energies of the other three into alignment with each other. When I first discovered this idea, I resonated with it deeply. The idea, originally Carl Jung’s, that there is a collective unconscious, a deep psychic field that connects all human beings, and which we are all born already-plugged-in-to, struck deep chords in me. Additionally the idea that there are archetypes, structures and patterns of potential in this deep unconscious, under whose influence we all live out our days, further infiltrated my inner landscape. While I saw similar ideas expressed beautifully elsewhere, it was in the model of Moore and Gillette that I found an archetypal system which featured the vertical dimension (moving from pathology to maturity), and deep insights into the archetypal shadow2. Furthermore, their system of four archetypes seemed deeply resonant with the ancient, pan-cultural concept of a cosmology of fours3. I was riveted, and I wanted to go deeper. And so I proceeded, with steadfast determination, to transform my life into an archetypal research laboratory. This experiment has now been going for almost a decade. Since 2008, I’ve researched this material and written extensively about it on Masculinity-Movies.com, where I applied the archetypal lens to movie culture. Not happy with merely engaging people’s minds and imagination, I eventually co-created a new and powerful form of archetypal process work, and channeled a transformational 3-month rite of passage for men. Along the way, I have come to believe that this archetypal model not only carries crucial insights for addressing the challenges we’re faced with as a species, but also for how to really enjoy our lives. In the autumn of 2012, I took off from the city of Oslo with my friend Pål Christian Buntz. 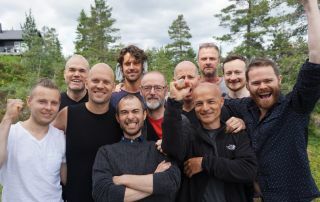 We were headed for his family’s summer house in the Hvaler archipelago in southern Norway, with the intention of creating a workshop based on the archetypal theories which had fascinated us both. We sat down and easily found our groove. We sifted through what we had learned elsewhere, gave it our own spin, and then created some pretty good content for the Warrior, Magician, and Lover archetypes. 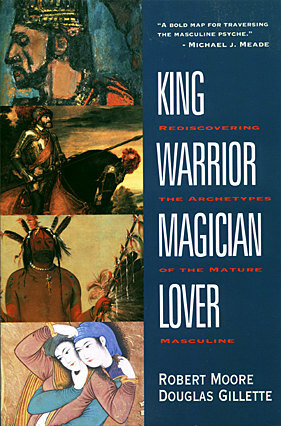 King, Warrior, Magician, Lover: Archetypes of the Mature Masculine by Robert L Moore and Douglas Gillette. The book where it all started. But we came up empty when we approached the King. We discovered that neither of us had ever been in a workshop or training where powerful work had been done on the King archetype. In fact, it seemed to us that the people we had learned from failed to address this archetype in satisfying ways. And so we had no inspiration to pull on as we approached our planning of this part of the workshop. A very intense day of meditation, prayer, heated discussions, experimentation and surrendering to the Mystery followed. Sometime in the late afternoon on Sunday, while in the middle of our experiments, I sat on a chair while Pål sat on the floor in front of me. He was transforming, becoming a shadow of himself, a boy begging for my blessings and the right to exist. And we both realized that my chair had morphed into his Throne, and I into his spiritual teacher. He started crying and I felt shivers down my spine. It was clear that what I was representing was not a benevolent force. I was embodying the Tyrant Usurper. I was the Shadow King. We realized something special had just happened; grace had arrived with its insights, and since that moment, my work has centered around the metaphor we received. It all went smoothly from there, and we proceeded to create a workshop process that contains the unique gifts of all four archetypes. I have since heard from many people that it’s the most powerful process work they have ever done or witnessed4. So as you may gather, in the liminal space that we had entered, I was temporarily occupying the center of Pål’s psyche, his central command. The felt sense of that Inner Throne will typically be in our hearts, and when we inhabit it, our lives are predominantly joyful, peaceful and harmonious. According to the beliefs of the ancients, the Sovereign’s throne is a meeting point between the lower and the higher, the human and the divine. Cultures have built their cosmologies around this nexus point, this axis mundi, since time immemorial, whether they depicted it as a throne, a holy mountain, a world tree, a pyramid, a temple or a castle. And of course, there can be no throne without a King, and so your Inner Throne always beckons, awaiting its heir. 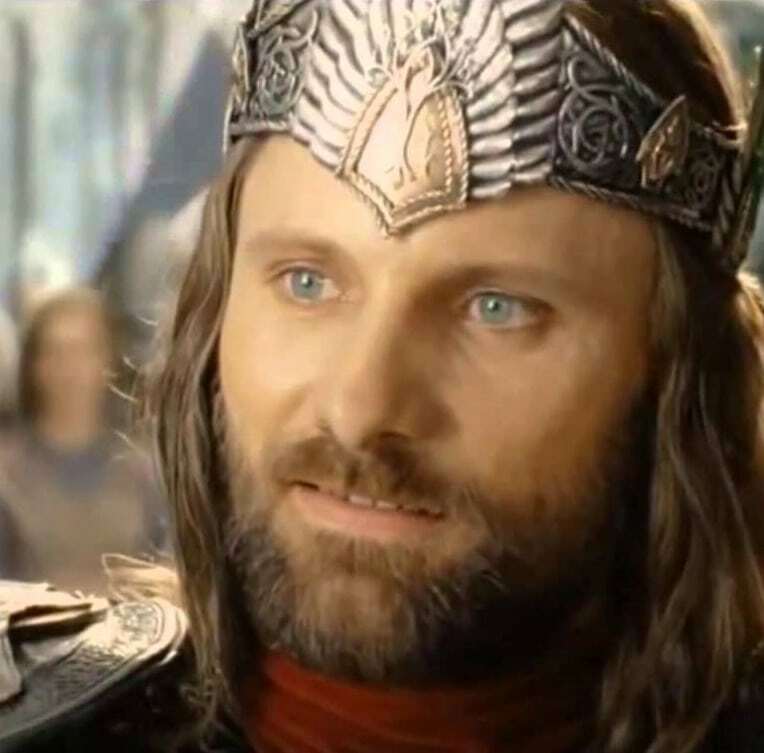 When you answer the call, Aragorn returns to your inner Gondor, the divine enters your interior world by way of the axis mundi, and you experience harmony and abundance. The dark clouds of despair part in your inner heavens, and the light of truth repels the forces of Chaos. But you don’t always answer the call. Many of us prefer, due to fear and the oftentimes seemingly insurmountable challenges of life, to leave our inner Gondor without a King. But the insight that arrived between Pål and myself that day will never leave me, and should serve as a warning sign for us all: When you vacate your Inner Throne, darkness claims it in your stead. It’s time to explore how that happens. Let’s look at an example, a hypothetical situation that you may or may not have experienced yourself. Whether the particulars of this example apply to you is not important. The importance is that you recognize the dynamics. So assume that your life is fairly smooth. Sure, it’s not a game of pattycake, but you get by. Then one day, a friend reveals a secret that compromises your status in your community. You know how dependent you are on this community and these people – in fact much of your self-worth and sense of identity is based on it – and so anxiety moves into your life with swift and brutal force. You get terrified of being humiliated, of losing things and people dear to you, and so you panic. You don’t notice, but while you are busy rejecting any responsibility for what’s unfolding, the Shadow King’s forces of Chaos usurp your Inner Throne. 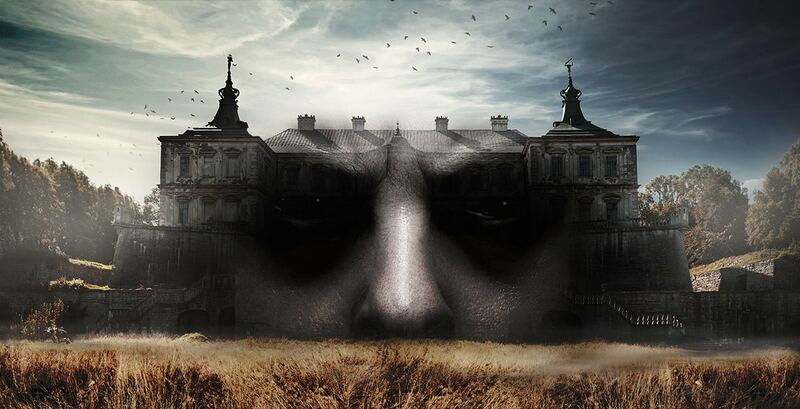 As you cling to your position as the victim, the Shadow King strengthens his rule over your interior domain, and your body starts aligning with your growing sense of enslavement by changing your brain chemistry, and putting you into full-blown psychological regression. A moment ago you had the best ideals in the world. You believed in world peace and abundance for all. But just as soon as your comfortable little community bubble burst did your ideals evaporate like dew drops on a hot summer morning. You are a three-year old fighting for your life now, and so you get nasty. You’re plotting your escape as well as your revenge, and manipulating people around you, all in an attempt to avoid the loss and the humiliation you fear so much. As your word and deed bring Chaos into the world, the sweet person you once were becomes a child soldier in the armies of darkness. What I’m describing here is an archetypal phenomenon. Archetypes, in other words, are not to be trifled with. They’re imperialistic forces of nature that are happy, just like a volcano spewing scorching volcanic ash over Pompeii5, to consume your psyche, annihilating you in the process. Every part of you that you do not embrace (by humbly acknowledging its existence), will form structural openings in your psyche (what you may refer to as triggers). These openings are the volcanoes of your inner landscape, tunnels to the Underworld through which the Shadow King and his armies can invade at their leisure given the right circumstances. And so when the world e.g. confronts you with your unacknowledged control patterns, you may answer by denying that they exist, and then mount a counter-attack to reclaim control over the situation (which goes to show that the human psyche is deeply irrational, and full of paradox and inconsistencies). When you embrace one of your parts, however, that part becomes integrated in your larger psyche through the light of your awareness. That “volcano” will now cease to be a source of Chaos and its elemental force will transform into the life-giving energy of the Returned King. We begin to feel more at home in the world, people cease to trigger us as much, and we learn to “fill our cup” and feel powerful in a really nice way. When I use descriptive terms such as volcano and dragon to describe archetypal energy, it’s because it tends to feel hot; being flooded with archetypal energy can literally feel like a fire in your nervous system. When we are sufficiently initiated and mature to deal with such energies, they can be properly contained and channeled, leading to rapid growth, and an expansion of our nervous system. But when our ego structure is wobbly, which for some people is often, for others just sometimes, and for a few always, the ego fails to filter these fiery energies6 properly, and it starts scorching our psyche. Unless an inner intervention is mounted by a recovering ego or an outer intervention is mounted by qualified psychiatry or a properly initiated Magician, this influx of unregulated archetypal energies can, over time, annihilate a person completely, burning his very humanity to ash. Dr Robert Moore has written beautifully about this in his brilliant book Facing the Dragon7. This phenomenon is frequently witnessed in psychologically unstable people, who often consider themselves to be avatars of God, or messengers of the Divine Will. These are people in whom the archetypal energy has so fully consumed their fragmented ego that they become lost to themselves and to the world. It’s bad enough when this dynamic triggers temporary dragon rage towards those you love. But at its worst, this dynamic, especially when it festers on its prey in isolation, can lead to tragedies such as acts of terror and school-massacres, where insecure, shy boys turn into hellfire demi-gods who pass judgement on the world8. So let’s be clear that the more anxious and disempowered a person is, the more he is vulnerable to archetypal shadow. This should be a point of great concern, because the level of anxiousness and disempowerment people across the world seem to currently experience is profound. Many of us have become terrified because we perceive the world through the twisted lens of the Shadow Magician. Saruman has sat down at many a news desk, and is now busy mounting his campaigns of propaganda and misinformation to pave way for the rule of the Shadow King, who has virtually consumed many of our world’s leaders, including the wretch we know as Donald Trump. The Shadow Magician works for the Shadow King. He always does. In the myths and in humanity. And when the Shadow Magician is succeeding in spreading fear around the world, the Shadow King is having a field day. We find him pulling the strings not only in the media, but in politics, marketing, the educational system, corporations, not to mention our families and workplaces. His purpose is singular – to enslave all human life. Now, this is a fairly heavy theme we are exploring here, so try and keep a lightness about you as you continue. There is no benefit in you freaking out. In fact, there is a lot of very good news in here, and when we take that on, as we will try in article #3, “Making Love in Times of the Apocalypse”, humanity will not only do fine, but prosper in amazing new ways. But for now, let’s wrap up our work of understanding the putrid presence of the Shadow King. It is important to note that the Shadow King is an archetype, and if you go looking for him in human form, you’ll merely find his avatars. That realization may at first be confusing. To complicate matters further, it’s entirely possible to adopt someone who is pure of mind and heart as the face of your Shadow King; if they fit with the shape of your trauma, you’ll cast them to serve that role in the drama of your life. As is the case with all archetypes, the Shadow King lives, together with his Shadow Queen and the rest of his royal court9, as patterns of psychic energy in the collective unconscious. Like all archetypes, he is a powerful elemental force that influences us continuously, and that given the right circumstances can flood the psyche of any human being. What this means – and this insight is crucial if you are going to be an agent of transformation in the coming time – is that the crooked politicians, journalists, lobbyists, ideologues and CEOs that you would blame for the the goings-on are just normal human beings who have fallen prey, due to their low level of psychological maturity, to a severe case of archetypal possession. In that sense, they are not Other. The same archetypal dynamics play out in you as well; they just tend to get stronger when you have access to more worldly power. Whether we speak of you or a world leader, the more power you have, and the more you are being projected upon by others, the greater your need for psychological maturity. So when you want to change the world by confronting its evils, take a breath, and start the search within. In this time of awakening, all activism must start with your reclaiming of your Inner Throne. When your inner kingdom returns to its true heir, the same archetypal energies that gave rise to the Shadow King alchemizes into the life-giving energies of the True King. Yet when you don’t reclaim your Inner Throne, you will base your work in the world on the assumption, conscious or not, that someone else is controlling your life. And when you believe that, the premise of your work is that you have already lost your Inner Throne. Your work is now reactive, a form of rebellion. And bit by bit, the Shadow King moves in and sets up shop. Left unchecked, this process will lead you towards strengthening the concept of enemy. And one day, sometime in the future, you will be eagerly searching, among those you consider evil, for ways to fill their inner worlds with poison. And while you may still be espousing the same lovely ideals you started out with, the real truth, for those with eyes to see, is that you are attempting to usurp their Inner Throne. And so the evil circle completes, and the Shadow King has succeeded at converting yet another human being to the dark side. In other words, having the right thoughts and ideals is not enough; you must claim responsibility for your own life experience and reject the influence of the Shadow King in your own inner kingdom, lest your word and deed bring more Chaos. Chaos. That’s your clue. If you want to find the Shadow King, follow the trail of Chaos. Where he walks, the world burns. To be continued in article #2: The Kingdoms of our Lives. Would you like to read the next Article? Join our mailing list to be notified when it’s ready. 1 The mythological world found in J.R.R Tolkien’s epic three-part novel The Lord of the Rings. 2 In the work of Moore and Gillette, archetypal shadow expresses through active and passive polarities. So the true nature of the Shadow King is that he exists as a constant fluctuation between the active Tyrant energies and the passive Weakling energies. This article focuses mostly on his Tyrant aspect. 3 The four elements, the four directions, the four stages of life, the four seasons etc. These ideas are prevalent in cultures around the world. If you want to go deeper with this, the Native American tradition is a great starting point. 4 Some people describe the Reclaim your Inner Throne process work as family constellations on steroids. You can sample it at the 2016 Circling Festival in the Netherlands and World Story Festival in Denmark in July. 5 Ancient Roman city in Southern Italy that was destroyed in AD 79 when Mount Vesuvius erupted, burying the city in tonnes of volcanic ash. 6 This energy has many names: The archetypal Self, the Sun in our Being, the God-force within, the Dragon etc. 8 Watch Elliot Rodger’s “retribution video” for an example of this phenomenon. 9 The Shadow King’s royal court consists of the Shadow Warrior, Shadow Magician, and Shadow Lover. I would add, that Donald Trump is supported as well (energetically) by those who hate him; this hate projected on him feeds and reinforces his own hate (rooted in whatever trauma the man had…). People who want to be ‘nice’ are, in fact, dangerous, because they don’t assume their shadow aspects, which will be projected around them, in people and circumstances. Actors and artists tend to channel the shadow aspects of society as a whole. I totally agree with you about the absolute need that each individual assumes the responsibility of his/her shadow aspects – which means, look at his/her unresolved and not integrated pain, anger, sadness, etc. I agree with you, Ana, that many of those who oppose Donald Trump in reactive ways are contributing greatly to his growing influence in the world. It’s a very important insight. When is the next part due, Eivind? I’m looking forward to it. It’ll come when it’s ready. But it just hasn’t been time yet. Some piece of the puzzle has not fallen into place. I’m not sure what I’m waiting for. Maybe for things to happen with the US elections. Awesome article Eivind, really enjoyed reading it. Deep knowledge and great writing too.